After one month, location A and B have doubled their ad clicks compared to location C using exactly the same monthly budget. Now again, we’re assuming each of the companies are targeting the same search terms, have the same quality scores, and the same monthly spend. Why is there a disparity in the results? Below is three bid quotes for the same keyword. Can you guess which suggested bid goes with the following cities for the search term “dentist near me”? Answer: It is Colorado Springs = $20.52, Nashville = $7.76 and San Francisco = $9.06. Breaking this down further into a monthly budget, let’s say each client was a dental practice that had a $1000 ad budget, or around $33 a day. The San Francisco and Nashville locations could see 4-5 clicks per day. The Colorado Springs location will only see 1, maybe 2, clicks for a particular key phrase. Over the course of a month that can equate to 30 – 60 clicks versus 120 – 150 clicks, a huge difference in an industry averaging around a 3% conversion rate. So why the bid variations? This variation in the bid price is most commonly associated with two things: demand and how likely the click is to convert. In the screen shot above you can see a broader list of suggested bid values for select terms. 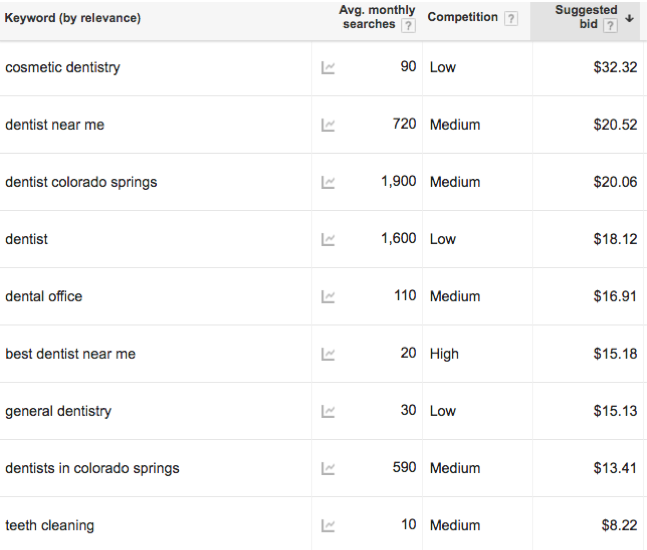 Although there are only 90 monthly searches for “cosmetic dentistry”, it holds a $30+ bid value, which is strange when the term “dentist” has 1600 monthly search volume. However, the revenue brought in from cosmetic procedures tends to be much higher than routine checkups, therefore this term is targeted by a lot of practices in the area. The demand creates a bump in the bid price for a click on “cosmetic dentistry” as local practices look to increase their ROI for high profit services. The second reason for the higher cost is the conversion factor, meaning those clicking on the ad for that specific term are more likely to convert into a lead. This means a broadly targeted word such as “dentist” will be less likely to convert than “best dentist near me”, despite having much greater search volume. Unfortunately, all is not equal in the local search world when it comes to bid prices, but there are things you can do to boost your clicks without increasing your spend. As I mentioned earlier, ad specialists know how to boost quality scores, earning you the lowest bid price through custom landing pages, effective copy, ad extensions, and campaign structuring. Also keep in mind clicks are not everything. Expensive bids are expensive for a reason. If you are seeing a high conversion rate off the few clicks you receive, it may be time to throttle up your ad spend. In my opinion, it is always a more effective strategy to increase spend on effective keywords that bring in leads – even if they are draining your current ad spend – than to gain more clicks by going after cheaper, lower demand keywords with lower conversion rate terms. For more information or to speak with an advertising specialist, contact Big Buzz.